Field hockey is a team game of the hockey family. The earliest origins of the game date back to the Middle Ages in Pakistan. The game can be played on grass, water turf, artificial turf or synthetic field as well as an indoor board surface. Each team plays with eleven players, including the goalie. Players use sticks made out of wood, carbon fibre, fibre glass or a combination of carbon fibre and fibre glass in different quantities to hit a round, hard, plastic ball. The length of the stick depends on the player's individual height. Only one face of the stick is allowed to be used. Goalies often have a different kind of stick, however they can also use an ordinary field hockey stick. The specific goal-keeping sticks have another curve at the end of the stick, this is to give them more surface area to save the ball. The uniform consists of shin guards, shoes, shorts, a mouth guard and a jersey. Today, the game is played globally, mainly in parts of Western Europe, South Asia, Southern Africa, Australia, New Zealand, Argentina, and parts of the United States. Known simply as "hockey" in many territories, the term "field hockey" is used primarily in Canada and the United States where ice hockey is more popular. In Sweden, the term "landhockey" is used and to some degree also in Norway where it is governed by Norway's Bandy Association. Known as The Wizard   or The Magician   of hockey for his superb ball control, Chand played internationally from 1926 to 1949; he scored 570 goals in 185 matches according to his autobiography, Goal. The Government of India awarded Chand India's third highest civilian honour of Padma Bhushan in 1956. His birthday, 29 August, is celebrated as National Sports Day in India every year. National Sports Day is a public holiday celebrated in various countries to honour the national sports teams and sports traditions of those countries. Dhyan Chand was born in Allahabad on August 29, 1905 in a Rajput family. Dhyan Chand was one of the most prominent Indian field hockey players. He was the elder brother of another hockey player Roop Singh, and the son of Sharadha Singh [ citation needed ] and Sameshwar Singh. Dhyan Chand's father was enlisted in the British Indian Army, and he played hockey for the army. Dhyan Chand had two brothers – Mool Singh and Roop Singh. Because of his father's numerous army transfers, the family had to move to different cities and as such Chand had to terminate his education after only six years of schooling. The family finally settled in Jhansi, Uttar Pradesh, India. Dhyanchand graduated from Victoria College, Gwalior in 1932. Being in the military, his father got a small piece of land for a house. Roop Singh Bais was a legendary Indian hockey player. He was part of the celebrated Indian field hockey team which won gold medals for India at 1932 and 1936 Olympic Games. He was the younger brother of Dhyan Chand, the most celebrated player in Indian hockey and widely regarded as the greatest hockey player ever. Captain Roop Singh himself is considered as one of the greatest hockey players of all times. The 1st Brahmans was an infantry regiment of the British Indian Army. It was raised at Oudh by Captain T Naylor in 1776 for service in the army of Nawab Wazir of Oudh, and was known as the Nawab Wazir's Regiment. It was transferred to the East India Company in 1777. In 1922, it was designated as the 4th Battalion 1st Punjab Regiment. The regiment was disbanded in 1931. The 1st Punjab Regiment was a regiment of the British Indian Army from 1922 to 1947. It was transferred to the Pakistan Army on independence in 1947, and amalgamated with the 14th, 15th and 16th Punjab Regiments in 1956, to form the Punjab Regiment. After successfully lobbying for reintroducing field hockey in the Olympics, the newly formed Indian Hockey Federation (IHF) made preparations to send its best possible team for the 1928 Amsterdam Olympics. In 1925, an Inter-Provincial Tournament was held to select the team members. Five teams participated in the inaugural nationals – United Provinces (UP), Punjab, Bengal, Rajputana and Central Provinces. Chand got permission from the Army to play for the United Provinces team. In its first game in the tournament. Dhyan Chand as the centre-forward, and Marthins, their inside-right, performed very well together. Chand attracted much attention by his clever stick-work. His penetrating runs and judicious passes seemed to assure for him a position in the team that is to take part in the Olympic Games. Early in the game, it became evident that Chand was at his best. In combination with Marthins he took the ball away to the right and Marthins did well to give him a good pass. Quick as lightning, Dhyan Chand shot a goal. The ball struck one of the defenders' stick and went into the net, giving goalkeeper Collie no chance. A goal within 3 minutes of the start was more than what the most optimistic of the UP supporters could expect. At the interval, UP led by three goals to nil. On their part, Rajputana put every ounce of their efforts to score. The UP goal had more than one narrow escape, but were the winners of a fine exhibition match (3–1). Buoyed by the success of the Tournament, it was decided that it would be held every two years. After two more trial matches between various hopefuls, the Olympic team (including Chand as center-forward) was announced and assembled in Bombay. Center-half Broome Eric Pinniger was selected as the captain. The IHF was initially low on funds since the provinces of Bombay, Madras and Burma had turned a deaf ear to their financial appeal, but they managed to scrape enough money. The Olympic team then played a match against the Bombay XI, and amazingly lost 3–2, even though Singh scored both his team's goals. With a quiet send-off, the team left for England on 10 March, to play 11 matches against local sides as well in the London Folkestone Festival in 1927, winning all. It was also said that Great Britain did not send a team in 1928 to the Amsterdam Olympics after their national team was defeated by the Indian team at Folkestone. This is best cited in Kapur's book Romance of Hockey where a despatch of H. Sutherland Stark, London representative of "Sports", a magazine of Lahore, tells the story better than any other comment : "For reasons it is difficult to understand the English Hockey Association have taken up a very stiff attitude towards Indian Hockey in recent years and have repeatedly been twitted about it by even their own supporters. The Editor of a leading sports newspaper described them to me as an intensely conservative body, but there seems to be something more than conservative behind their unwillingness apparently ever to meet India ina full international encounter". Finally, on 24 April, the team arrived in Amsterdam to embark on a tour of the Low Countries. In all the pre-Olympic matches against local Dutch, German and Belgian teams, the Indian team won by large margins. On returning to India, the team was received by thousands of people at the Bombay harbour, compared to the three people who had seen them off. Posted in Waziristan in the North-West Frontier Province (now in Pakistan) with his new 2/14 Punjab Regiment, Chand, by now a naik (corporal) was cut off from the IHF, which was by now controlled by civilians. The Inter-Provincial Tournament was being held to select the new Olympic team; the IHF wrote to the Army Sports Control Board to grant Singh leaves to participate in the nationals. His platoon refused. Chand received news that he had been selected by the IHF for the Olympic team without any formalities. The rest of his teammates however, had to prove their skills in the Inter-Provincial Tournament, which was won by Punjab. As such, seven players from Punjab were selected for the Olympic team. Apart from Chand, Broome Eric Pinnigar, Leslie Hammond and Richard Allen were the other 1928 Olympians retained in the team. Chand's brother Roop Singh was also included in the squad as a left-in. Lal Shah Bokhari was selected as captain. The Olympic team then played practice matches in India before heading for Colombo. In two matches in Ceylon, the Olympic team beat the All Ceylon XI 20–0 and 10–0. Wrote one newspaper on the first match,  "Perfection is perilous, for it tempts the gods. For once, this was proved wrong for even the god of weather paid tribute to the genius of the Indian players. Rain clouds, which had threatened to ruin the game, vanished into the blue, and thousands of spectators spent a happy hour marveling at the incomparable artistry of the Indian team." The India team set sail for San Francisco on 30 May, and arrived on 6 July. They reached Los Angeles three weeks before the opening ceremony of the Olympics, which took place on 30 July. On 4 August 1932, India played its first match against Japan and won 11–1. Chand, Roop Singh, Gurmit Singh each scored thrice, and Dickie Carr once. In the final on 11 August, India played against hosts USA. India won 24–1, a world record at that time (until it was broken in 2003), and once again clinched the gold medal. Chand scored 8 times, Roop Singh 10, Gurmit Singh 5 and Pinniger once. In fact, Chand along with his brother Roop, scored 25 out of the 35 goals scored by India. This led to them being dubbed the 'hockey twins'. One Los Angeles newspaper wrote,  "The All-India field hockey team which G. D. Sondhi brought to Los Angeles to defend their 1928 Olympic title, was like a typhoon out of the east. They trampled under their feet and all but shoved out of the Olympic stadium the eleven players representing the United States." The team then embarked on a tour of the United States. They played a match on 20 August against a United States XI, almost the same team that they had faced in Los Angeles. Even after loaning its second keeper Arthur Hind, for a half, the team won 24–1. After setting sail from New York, the team arrived at England. The then embarked on a hectic tour, playing nine matches in various countries in a fortnight, commencing on 2 September. They played four internationals-against the Netherlands, Germany, Czechoslovakia and Hungary. The team then reached Sri Lanka and India, playing a number of matches to pay for their expenses. At the end of the tour, India had played 37 matches, winning 34, drawing 2, with one abandoned. Chand scored 133 of the 338 Indian goals. In India he is often referred to as Hockey ka Jaadugar which translates to "Magician of the game of Hockey". “ If anybody asked me which was the best match that I played in, I will unhesitatingly say that it was the 1933 Beighton Cup final between Calcutta Customs and Jhansi Heroes. Calcutta Customs was a great side those days; they had Shaukat Ali, Asad Ali, Claude Deefholts, Seaman, Mohsin, and many others who were then in the first flight of Indian hockey. I had a very young side. Besides my brother Roop Singh, and Ismail, who played for the Great Indian Peninsular Railway in Mumbai, I had no other really great player in the team. But I had a team which was determined to do or die. It was a great match, full of thrills, and it was just opportunism that gave us the victory. Customs were pressing hard and our goal was at their mercy. Suddenly I broke through and from midfield gave a long through pass to Ismail, who ran with Jesse Owens' speed half the length of the ground. A misunderstanding occurred between the Customs left-half and the goalkeeper, and Ismail, taking every advantage of it, cut through and netted the only goal of the match. We felt very proud of our triumph. In Kolkata, the Heroes also won the Lakshmibilas Cup tournament, which was open only to Indian teams. In 1935, they successfully defended their Beighton Cup title, though lost the subsequent year. In December 1934, the IHF decided to send a team to New Zealand in the new year. Chand and his brother were immediately selected. When the Nawab of Manavadar declined to play, Chand was appointed captain. In the subsequent tour, the team played a total of 48 matches on this tour, with 28 in New Zealand and the remainder in India, Ceylon and Australia. India won every match, scoring 584 goals and conceding only 40. Of these 48 matches, Chand played 23 and scored a total of 201 goals. Upon returning to India, Chand resumed his duties in the barracks. In December 1935, the IHF decided to stage the Inter-Provincial tournament to select the Olympic team. Chand was again denied permission to leave his platoon, though once again he was selected without formalities. The final team assembled in Delhi on 16 June and played against the Delhi Hockey XI. Incredibly, they lost 4–1. After this inauspicious start, the team went on a successful tour of the subcontinent, finally departing for Marseilles on 27 June. They arrived on 10 July, and after an uncomfortable journey in third-class compartments, reached Berlin on 13 July. On 17 July, the Indian team played a practice match against Germany and lost 4–1. As such, manager Pankaj Gupta informed the IHF that Ali Dara had to be sent immediately to replace the out of form Mirza Masood. “ Every member of the team was feeling the strain of the defeat to the Germans in the practice match, and no one was in his usual self. I never saw a hockey team from India, where the game is definitely of a superior standard compared to the rest of the world, being so obsessed on the eve of the match. The players were nervous as to what the result of the match would be, which was heightened by the feeling that the burden of the country's honour was on their shoulders. The game was played at a fast pace and was packed with thrilling incidents. The Germans undercut and lifted the ball, but the Indian team countered with brilliant half-volleying and amazing long shots. Twice Dara attempted to score but was declared offside. Dhyan Chand discarded his spiked shoes and stockings and played with bare legs and rubber soles and became speedier in the second half. The vigorous German attacks were brilliantly saved by Allen and Tapsell. The goal scored by Weiss of Germany was the only goal scored against the Indians throughout the tournament. The whole Indian team put up a splendid display. Dhyan Chand and Dara impressed by their combination, Tapsell by his reliability and Jaffar by his tremendous bursts of speed. Towards the closing phases of the war, Chand led an army hockey team which toured around the battlefields in Manipur, Burma, the Far East and Ceylon. When the war ended in 1945, Chand decided that the Indian hockey team needed new young players. In 1947, the IHF was requested by the Asian Sports Association (ASA) of East Africa to send a team to play a series of matches. The ASA made a condition that Chand should be included in the team. Once again, Chand was chosen as captain. The team assembled in Bombay on 23 November 1947, and reached Mombasa on 15 December and played 9 matches in British East Africa winning all. Chand, though now in his forties, still managed to score 61 goals in 22 matches. After returning from the East African tour in early 1948, Chand decided to gradually phase out his involvement in 'serious hockey'. He played exhibition matches, leading a Rest of India side against state teams and the 1948 Olympic team which defeated Chand's side 2–1, even though an aging Chand scored his side's lone goal. Chand's last match was leading the Rest of India team against the Bengal side. The match ended in a draw after which the Bengal Hockey Association organized a public function to honor Chand's services to Indian hockey. Chand continued to hold his emergency commission in the Indian Army post-Independence, with the service number IEC 3526, but was apparently not granted a regular commission. In 1951 he was honored at India's National Stadium with the inaugural Dhyan Chand Tournament, which he attended to the admiration of the spectators. After retirement, he taught at coaching camps at Mount Abu, Rajasthan. Later, he accepted the position of Chief Hockey Coach at the National Institute of Sports, Patiala, a post he held for several years. Chand spent his last days in his hometown of Jhansi, Uttar Pradesh, India. Dhyan Chand remains a legendary figure in Indian and world hockey. His skills have been glorified in various apocryphal stories and anecdotes. A number of such these revolve around the fact that Singh had an extraordinary control over dribbling the ball. Chand's birthday, 29 August, is celebrated as National Sports Day in India. The President gives away sport-related awards such as the Rajiv Gandhi Khel Ratna, Arjuna Award and Dronacharya Award on this day at the Rashtrapati Bhavan, India. 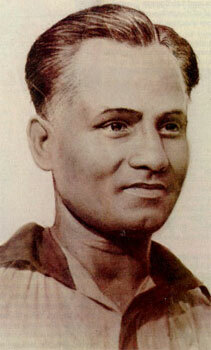 The 20th National Award 2012, the Gem of India, awarded by the Union Minister of India, was given to Dhyan Chand. The award was received by Dhyan Chand’s son, Ashok Dhyan Chand (a hockey Olympian in his own right) on behalf of his deceased father. The award was given by Journalist Association of India under the flagship of Journalists Federation of India, Sirifort Auditorium, New Delhi, India, on 22 September 2012. Ignacious ("Ignace") Tirkey is an Indian field Hockey player. He plays as a Fullback and has captained the Indian team. Kunwar Digvijay Singh, popularly known as "Babu", was an Indian field hockey player, who is regarded as one of the greatest players in the history of the sport. He was born in Barabanki, Uttar Pradesh. He is widely known for his mesmerising passing ability and is considered by many to be the greatest dribbler of the game comparable only to Dhyan Chand. Shankar Lakshman was an Indian hockey player. He was goalkeeper of the Indian team in the 1956, 1960 and 1964 Olympics, that won two gold medals and one silver medal. He was the first goalkeeper to become captain of an international hockey team and was awarded the Arjuna award and the Padmasri by the Indian government. He was captain of the Indian team which won the gold in the 1966 Asian Games. After missing the selection for the 1968 Olympics, Lakshman quit hockey. He remained with the Army, retiring in 1979 as a captain of the Maratha Light Infantry. He died in 2006 after suffering gangrene in one leg in Mhow. Harbinder Singh is a former field hockey player from India. He started his international career in 1961 at the age of 18 years [youngest member of the team] with a tour to New Zealand and Australia with Indian hockey team. During the span of 12 years from 1961 to 1972 had represented the country in three Olympics – Tokyo 1964 — gold medal [scored highest field goals – 5 out of 9 goals], Mexico 1968 — bronze medal [scored highest field goals – 6 out of 11, including hat-trick against Mexico] and was also selected as a centre forward in the "World XI", in Munich 1972 — bronze medal. Kishan Lal was an Indian field hockey player. He captained the Indian hockey team in 1948, which won its first gold at the Olympics as an independent country, defeating Great Britain in the final, 4-0. Beighton Cup is one of the oldest field hockey tournament running till date. Instituted in 1895, it is organised by Bengal Hockey Association and used to be held on natural grass at the Mohun Bagan ground on the Maidan in Kolkata in India and for last few years has been held on Astro Turf at Sports Authority of India in Kolkata. The Beighton Cup was presented by T.D. Beighton, Legal Remembrancer of the Government of Bengal, and was run initially by the Indian Football Association. The Calcutta Hockey League took off in 1905. Pankaj Kumar Gupta MBE was one of the earliest Indian sports administrators involved in football, hockey and cricket. However, he gave his life for hockey, as a manager, administrator, and even a referee. Many called him "Mr. Hockey". Joseph "Joe" Phillips was an Indian field hockey player who competed in the 1936 Summer Olympics. Ashok Kumar(born 1 June 1950 in Meerut, Uttar Pradesh), is a former Indian professional field hockey player. He is the son of the Indian hockey legend Dhyan Chand Singh. Ashok Kumar is one of the legends in Indian hockey was known for his exceptional skills and ball control. He was a member of the Indian team that won the 1975 World Cup. Prithipal Singh was an Indian field hockey player nicknamed the “King of short corner” by hockey commentators. He participated in the Olympic field hockey three times and each time he scored the highest number of goals as a single player. Singh was a player with sharp reflexes, and the tremendous strength in his long and powerful arms produced firmest and sticking shots which unfailingly fetched him goals and often the winners. The Evening Post, New Zealand commented in 1961 that to face the fury of Prithipal's hit is to risk one's life. Another author commented that if Arjuna was the Maharathi of the Mahabharata war, Prithipal was the Maharathi of the International Hockey game. The first-ever Arjuna Award to a hockey player was conferred upon him in 1961, which was later followed by the Padma Shri in 1967. Singh won Olympic medals in Rome, Tokyo and Mexico. The Dhyan Chand Award, officially known as Dhyan Chand Award for Lifetime Achievement in Sports and Games, is the lifetime achievement sporting honour of the Republic of India. The award is named after Dhyan Chand (1905–79), an Indian field hockey player who scored more than 1000 goals during a career which spanned over 20 years from 1926 to 1948. It is awarded annually by the Ministry of Youth Affairs and Sports. Recipients are selected by a committee constituted by the Ministry and are honoured for their contributions to sport both during their active sporting career and after retirement. As of 2016, the award comprises a statuette, a certificate, ceremonial dress, and a cash prize of ₹5 lakh (US$7,000). The cash prize was revised from ₹3 lakh (US$4,200) to ₹5 lakh (US$7,000) in 2009. Pradeep Kumar Jain 'Aditya', is an Indian politician from Indian National Congress (INC), who was Minister of State in Ministry of Rural Development in the 2009 Union Cabinet. Mukhbain Singh is an Olympian. Shabbir Ali, is an Indian association football manager and former player. World Series Hockey (WSH) was a professional league for field hockey competition in India. It was organised by Indian Hockey Federation and Nimbus Sports with the objective to reinvigorate hockey in India. It was contested among eight franchisee-based teams consisting of players from India and around the world. The entire event took place on home and away basis culminating into multi header playoffs. Australian Dennis Meredith, a member of the FIH panel of tournament directors is the technical director of the WSH. It is currently sponsored by tyre manufacturers, Bridgestone, and therefore officially known as Bridgestone World Series Hockey. Jagbir Singh the former Indian field hockey Centre Forward represented India in two Olympics, 1990 World Cup and was a leading light of the Indian team in all the major tournaments, for a decade, from 1985–95, including two Asian Games, the 1989 Asia Cup & Champions trophy. Mandeep Singh is an Indian professional field hockey player who currently plays as a forward for Ranchi Rhinos in the Hockey India League and the Indian national team. Major Dhyan Chand Hockey Stadium is a hockey ground in Jhansi, India. The stadium is mostly used for Hockey purposes and has got coaching facility. The stadium is named after Major Dhyan Chand who lived in Jhansi. Balbir Singh Dosanjh is a former hockey player from India. He is a three-time Olympic gold champion having played a key role in India's wins in London (1948), Helsinki (1952), and Melbourne (1956) Olympics. He is regarded as one of the greatest hockey players of all time, a modern-day Dhyan Chand, a legend of the sport and is widely regarded as the sport's greatest ever centre-forward. His Olympic record for most goals scored by an individual in an Olympic men's hockey final remains unbeaten. Singh set this record when he scored five goals in India's 6–1 victory over the Netherlands in the gold medal game of the 1952 Olympic Games. He is often called Balbir Singh Senior to distinguish him from other Indian hockey players named Balbir Singh. ↑ "Indian hockey's famous legend Dhyan Chand's resume". Mid yDay . 3 December 2015. Archived from the original on 1 April 2016. Retrieved 1 April 2016. ↑ Dharma Raja, M.K. "Hockey Wizard Dhyan Chand Remembered". Press Information Bureau . Government of India. Archived from the original on 1 April 2016. Retrieved 1 April 2016. ↑ When sports legend Dhyan Chand was offered a job by Adolf Hitler. Indianexpress.com (29 August 2017). Retrieved on 2018-12-12. ↑ "Find out about India's hockey wizard". bbc.co.uk. ↑ "Dhyan Chand – The Legend Lives On". bhartiyahockey.org. ↑ "National Sports Day: PM Narendra Modi pays tribute to Major Dhyan Chand on birth anniversary". Indian Express. 29 August 2017. ↑ "'Remembering Dhyan Chand, the magician'". rediff.com. 28 August 2010. ↑ Chand, p. 2: "I was born in Allahabad on August 29, 1905. I come from a Rajput family which settled in Allahabad and later migrated to Jhansi." ↑ Majumdar, Boria; Mehta, Nalin (2009). India and the Olympics. Routledge. p. 272. ISBN 978-1-135-27574-7. ↑ "Dhyan Chand Profile – Indian Hockey Player Dhyan Chand Biography – Information on Dhyan Chand". www.iloveindia.com. Retrieved 23 August 2016. 1 2 3 "The Legend of Dhyan Chand". The Hindu. 29 August 2017. Retrieved 27 January 2019. 1 2 Indian Army List for April 1941 (Part I). Government of India Press. 1941. p. 835. ↑ "Indian Army Hockey team". The Straits Times . 24 March 1926. p. 15. Retrieved 10 February 2018. ↑ Kapur, Mohan Lal (1968). Romance of Hockey. M.L. Kapur. p. 38. ↑ National Sports Day 2017: Remembering 'The Wizard' Major Dhyan Chand on his birthday. Daily Hunt, India (29 August 2017). Retrieved on 12 December 2018. ↑ Dhyan Chand Captain of the Indian Olympic Field hockey Team 1936. HockeyGods. Retrieved on 12 December 2018. ↑ Typhoon from the East. Bharatiyahockey.org. ↑ Major Dhyan Chand. Slideshare.net. Retrieved on 12 December 2018. ↑ What is the best thing ever to come out of India?. Quora. Retrieved on 12 December 2018. ↑ Indian Army List for July 1942. Government of India Press. 1942. p. 1467. ↑ Indian Army List for April 1943 (Parts I and II). Government of India Press. 1943. p. 1615. ↑ Indian Army List August 1947 (Special Edition). Government of India Press. 1947. pp. 764 A. 1 2 3 "Part I-Section 4: Ministry of Defence (Army Branch)". The Gazette of India. 30 March 1957. p. 80. ↑ Dharma Raja, M.K. (August 2000). "Hockey Wizard Dhyan Chand Remembered". Press Information Bureau, Government of India. Retrieved 4 January 2012. ↑ "Dhyan Chand never expected anything: Ashok Kumar". Times of India. India. 30 August 2011. ↑ "Last Days of Dhyan Chand". www.bharatiyahockey.org. Retrieved 23 August 2016. ↑ "Even Bradman was impressed with Dhyan Chand". The Times of India. 30 August 2011. ↑ Ali, Qaiser Mohammad (30 April 2011). "Some hearts still beat for hockey here". India Today. ↑ "Aligarh Muslim University || Halls". www.amu.ac.in. Retrieved 29 August 2016. ↑ "Discover hockey's answer to Pele". BBC news-Sports. 26 February 2004. Retrieved 4 January 2012. ↑ "Hockey pitch in London named after Dhyan Chand". Zee News. India. 23 August 2011. ↑ "Dhyan Chand Chronology". www.bharatiyahockey.org. Retrieved 23 August 2016. ↑ Sharma, Aman (18 November 2013). "Bharat Ratna: Does hockey legend late Dhyan Chand deserve it more than cricketing icon Sachin Tendulkar?". The Economic Times. ↑ "Dhyan Chand deserves Bharat Ratna: Nana Patekar". DNA India. 2 January 2014. ↑ "Fans hold rally demanding Bharat Ratna for Dhyan Chand". India Today. 8 January 2014. Archived from the original on 9 October 2014. ↑ "Sachin Tendulkar and CNR Rao conferred Bharat Ratna". The Times of India. 4 February 2014. ↑ "I have no hope of Bharat Ratna for Dhyan Chand now: Ashok Kumar". NDTV SPORTS. 5 February 2014. Archived from the original on 10 June 2014. Retrieved 25 May 2014. ↑ "PMO ignored Dhyan Chand to confer Sachin Tendulkar the Bharat Ratna?". Zee News. 21 May 2014. Chand, Dhyan (1952). Goal! Autobiography of Hockey Wizard Dhyan Chand. Chennai: Sport & Pastime. Wikimedia Commons has media related to Dhyan Chand .